You put road studs in the cycle path, that follow the orbital cycle of the traffic light. The lights are synchronised with the traffic light: when the traffic light is about to change to green, the road studs in the cycle lane are switched on. If the cyclists cycle within the range of the lit road studs, the cyclists will be able to cross the intersection whilst the traffic light is green. As the time before the traffic light turns back to red again is shortened, the road studs are switched off, one by one. 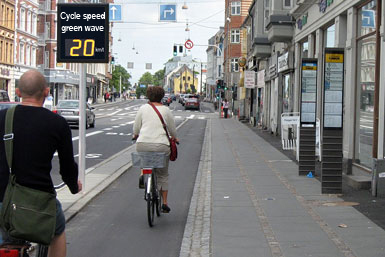 An alternative could be a "green wave cycle speed", that shows the cyclists how fast they have to cycle to cross the intersection whilst the traffic light is green.